Liverpool is bucking the national trend of falling bus passenger numbers, according to new research. The passenger watchdog Transport Focus released the results as part of a bus passenger survey, looking into customer satisfaction in different areas including fares, journey times and anti-social behaviour. According to the survey, 75% of passengers are satisfied with the value for money they are getting from the service. Numbers of people opting to take the bus have also risen by 9% across Merseyside since last year. 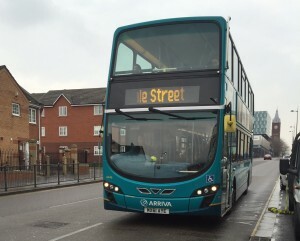 To continue improving services, Merseyside companies Arriva, Merseytravel and Stagecoach have created an alliance called the ‘Better by Bus’ campaign. The aim is to get more people travelling on the bus by offering new vehicles, onboard tech and smart ticketing. Lisa Pearson, campaign conductor for Better By Bus, told JMU Journalism: “This increase is a testament to the growing number of people who see bus as a viable way of getting from A to B. The research also showed that 91% of paying Merseyside bus users are satisfied or very satisfied with services, which is the joint highest of any metropolitan area. Merseytravel says the passenger growth is down to more young people opting to use the bus since 2014. This is thanks to the introduction of the £2.20 ‘MyTicket’, which allows under 19’s unlimited travel on any bus across Merseyside. A reduction in the cost of bus operators’ weekly tickets is also believed to have contributed to boosting the number of adult users.